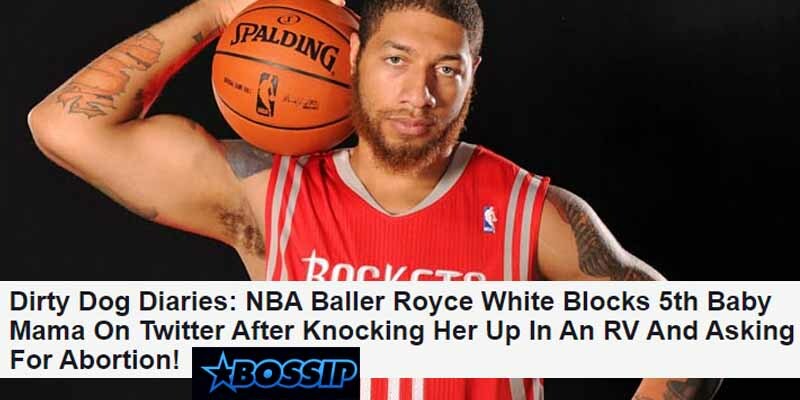 Royce White‘s NBA career consisted of only 3 games for the Sacramento Kings at 3 minutes apiece, but he made more headlines during his draft year in 2012 than the #1 pick Anthony Davis and Rookie Of The Year Damian Lillard. This was mostly because of his fear of flying that caused all kinds of problems for the Rockets, but also because there were reports of him having fathered 5 illegitimate children with 5 different women, including a “friend” who he allegedly impregnated in an RV then blocked on Twitter after he found out she was pregnant. Another lady, Fatima Jaed, claimed he gave her $20,000 for an abortion she never went through with. SMH. Stay classy and wrap it up, kids.